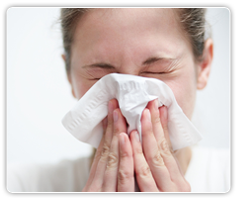 Allergies— be them seasonal, skin, sinus, flu, or congestion are a misery. What is even more tormenting is that people barely get relieved of it permanently in spite of plenty of OTC drugs, oral medications, home remedies etc. How to treat allergy quickly must be your only question to us. For skin allergies treatment in Delhi (west Delhi) we are the best & offers the best line of treatment. Well! For all your allergy issues, we have a standalone defense that helps control allergy with absolutely NO side Effects at Dermal World located in Rajouri Garden, New Rajinder Nagar, Sir Ganga Ram, & Karol Bagh. Our line of treatment helps treat inflammation and irritation in the skin without affecting your immune or adrenal system. Our innovatively created skin-friendly- formulas are a good choice for sensitive skins. Further, with just a little tweaks to your diet and lifestyle as would prescribed by the Derma Specialist, we are sure that you are not going to face with it again. There are various factors which contribute to skin irritations, including heat, medications, infections and immune system disorders. When an allergen is accountable for triggering an immune system response, the irritation is an allergic skin condition. Allergic contact dermatitis occurs when skin comes in direct contact with an allergen. For example, if you are allergic to nickel and your skin comes in contact with nickel-made jewellery, your skin may become scaly, itchy, swollen, and bumpy at the point of contact. Several skin allergies and rashes cause itching, however, not all rashes that itch are related to skin allergies. Rohit Batra’s skin clinic in Delhi provides treatment for all kinds of skin allergies. Skin laser treatment in Delhi is offered with the help of advanced techniques and methods by the best skin specialists. Atopic Dermatitis (Eczema) Atopic dermatitis occurs mostly in young children, although it also occur in young adults, and continue through adult life. The rash of atopic dermatitis, known as eczema, occurs when a person scratches. It is usually red, often flakes or oozes, and has small blisters or bumps. In infancy, the rash can appear on the chest, cheeks and scalp, where the child is able to scratch. Adults can have the rash in the skin folds of the elbows, behind the knees and also on the neck, hands, feet and back. Urticaria (Hives) and Angioedema (Swelling) Also known as hives, Urticaria is an itchy rash that can occur at any age. 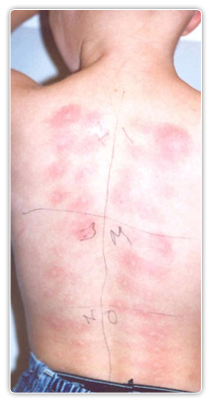 This rash appears as red bumps of various shapes and sizes, and may last from few minutes to hours. It is very itchy and can make a person scratch so much that it starts bleeding. The swelling that sometimes goes along with hives is called angioedema, and often involves the lips, the eyes, the hands and feet. Angioedema tends to burn, sting or cause a tingling sensation. Sometimes severe swelling can block the ability to breathe and can be dangerous and even-life threatening. Contact Dermatitis Contact dermatitis is caused when the skin comes in contact with a substance that causes a rash-like reaction. People may react to a variety of chemicals, hair dyes, metals, topical medications and dental materials. A rash of contact dermatitis may look like atopic dermatitis, but is typically located in the area of contact with the offending chemical. It happens mostly on the eyelids, neck, hands and feet. Itching Without a Rash It’s a common problem that an itching may happen without any rash being present. When itching is limited to a certain area of the body, the most likely reason is a disease limited to the skin. The area of the body that itches often gives a big clue about the cause of the itching. Moreover, many medications can cause itching, particularly pain medications like codeine and morphine.